The image below shows the main graphic elements that appear in a track (shown after clicking the "Full Height" button) which contains a Warped Signal (including a Warp Region, a Warp Process Output or APT Output). Using the Full Height toggle gives better view of the features and finer control of adjustments. 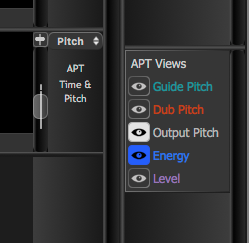 In this example, to keep the discussion simple we are not displaying the Track's "Level" values, which can be switched on and off using the S key in the Warp Process. 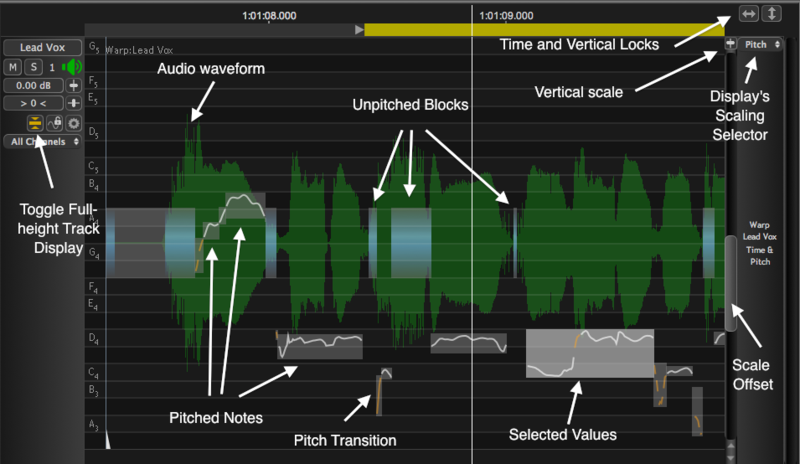 In the image above, where the audio signal has a measurable Pitch, the pitch measurement traces are automatically Grouped inside Note Blocks based around an average pitch for a duration determined using the pitch group's trajectory to determine "notes". One or more Blocks can be selected, as shown by the Block colour change for "Selected Values" group above, and if the mouse cursor is placed within or on the edges of a selected Block, the cursor shape will indicate the available movements. The faint grid in the background is a Pitch Grid, which can be set to display the intervals of various musical scales, as described further in the Musical Scales chapter. The notes displayed on that grid can be selected using the Scales menu in the transport area at the bottom right of the main window, as shown below.